As explained in the corporation, 57-mm AU-220M weapon station, created by the Burevestnik Central Research Institute (included in the UVZ), can be remotely controlled. "Its newest gun not only has increased accuracy of shooting and armor penetration, but it can be controlled remotely," the corporation noted. 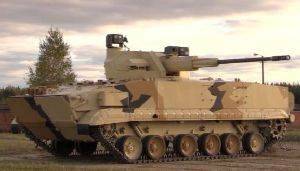 Such a function makes it possible to use BMP us a highly effective firing point, capable of destroying both ground and air targets. The crew in this case can completely leave the vehicle. The video demonstrates the ability of the new vehicle to hit targets with high accuracy. Also shown is the accuracy of the firing with the help of tracer projectiles caliber 57-mm.